Compound Trader Review - What a Scam! 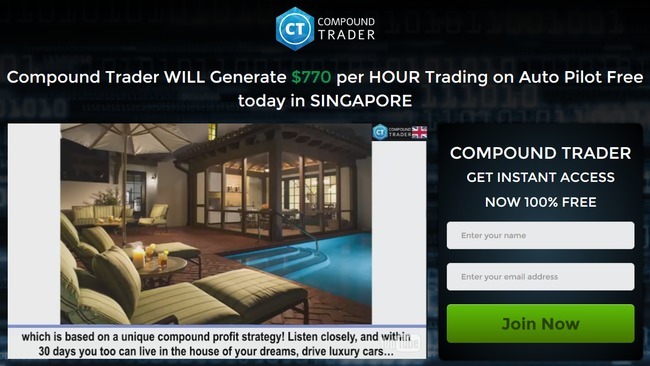 Compound Trader by Albert Henderson claims to make you a guaranteed $12,000 a day, but don’t be fooled – Compound Trader is a scam! We’ve done a thorough investigation and documented all the powerful evidence in this Compound Trader review, so make sure you read through it before plunging into an obvious scam. As soon as you enter the homepage of Compound Trader scam, you will be presented with an auto-play sales video that aim to brainwash you. If you have been looking to generate quick riches from the internet, you are the target audience of this scam. Did you notice how they start off the sales video with the promises of dream house, luxury cars, and exotic vacations? They were trying to get you excited with what they have to say, and coupled with the headline that promises $770 profits an hour on auto-pilot, most people will take the time to watch the video. Albert Henderson, the alleged founder of Compound Trader software claims that his software can capitalize on the profits from winning trades and roll them over to subsequent trades to achieve compounding effect. The logic is sound and valid, but it all depends on the software’s ability to generate winning trades in the first place – in which Henderson claims that winning trades are guaranteed with his Compound Trader software. He has even provided a table with live profits to ease your mind, but can you really trust him? Below the sales video, Compound Trader scam provides a table that continually updates itself with the “live profits” generated from the software. It displays the date and time of the trades, as well as the amount of profits generated from each trade. However, anyone who have traded binary options before would know that the market operates 5 days a week – from Monday to Friday. There’s no market activity on weekends. This review was written on a Sunday, 24 July 2016 (refer to the date from the screenshot above). According the “live trades” panel, the software was still making trades on a day where there’s no market activity. How is this possible? Apparently, the live trade section for Mirror Trader was just a fake results panel generated using a computer script that pair random results with your current time. No real trades have been performed behind those profits. The same tricks were used in Mirror Trader scam that we have reviewed before. The fake profits table would’ve worked well during the weekdays, but when it comes to weekends their trick would be exposed. 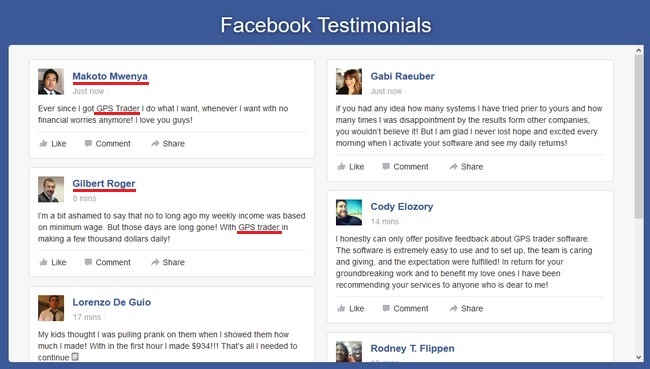 What About the Comments by Facebook Users? The scammers behind Compound Trader understand the power of social approval, so they have included a section with fake Facebook posts. How did we come to the conclusion that these posts are fake? At first glance, they may seem like genuine social media posts. But if you look closer, you’ll realize that they are just a wall of text formatted to look like Facebook posts. Try clicking on the profile pictures or interacting with them. Unlike real posts, you can’t like, share or even comment on them. Of course, you can’t visit the Facebook profiles of these members too. 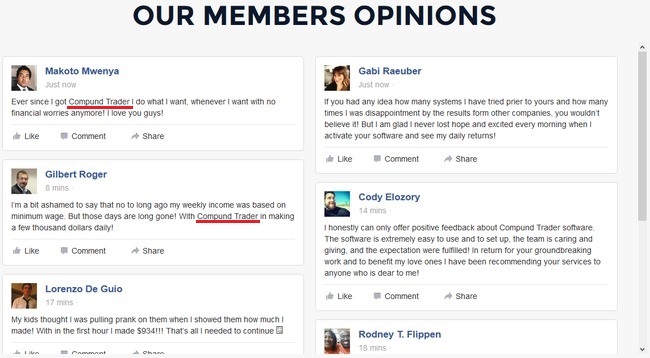 Turns out that the very same Facebook posts template has been used by another scam that we have reviewed before, GPS Trader scam. Compare the screenshot above (from GPS Trader) with the previous one from Compound Trader scam. The comments are exactly the same, only the name of the software has been changed (underlined in red). 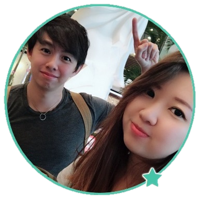 If you want to verify our claim for yourself, here’s the official website of GPS Trader. These 2 scams are most likely sister sites that belong to the same company. Even the name of the scams are similar (Compound Trader vs GPS Trader). No matter how Compound Trader tries to deceive its victims, they have to reveal the true nature of the scam somewhere in the website, or risk being on the receiving end of legal actions. It’s just like those hidden terms and conditions in some unfair agreements that you might have come across. Compound Trader scam chose to hide the truth in the risk disclaimer document, in which you can’t find anywhere in the sales material. You can authenticate the terms we’ve quoted here against the original document on their website: websiteterms.co/CompoundTrader. Due to the high risk nature of trading, ‘Compound Trader” explicitly does not make any express or implied warranties or guarantees that user will make any profit or that user will not lose any or all deposited investment funds. Self explanatory – Contrary to what they promise in the sales materials, Compound Trader scam does not guarantee you any profit. Not only that, you will most likely end up losing ALL your deposited investment funds. Again, Compound Trader scam admits that trading binary options is extremely risky, and it is only for investors who can stomach the loss of their entire investments. YES, COMPOUND TRADER IS A SCAM. We strongly advise you to stay away from the scam if you don’t want to lose your hard-earned money. Wish I read this review earlier! I lost $300 and now the broker won’t even pick up my calls! SCAM! Hey Lonnie, it’s hard to get back your money once it’s been lost with a trading software. Take it as a lesson and move on.